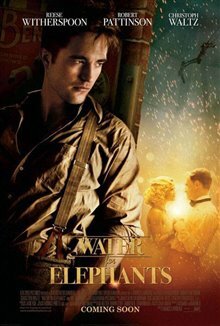 Devastated by the sudden death of his parents in a car crash, veterinary student Jacob Jankowski (Robert Pattinson) abandons his studies in his final year and hops aboard a train. He soon finds out it's part of a traveling circus and tries to get a job with them. When August (Christoph Waltz), the head animal trainer, finds out Jacob is a veterinarian, he hires him to look after the animals. Jacob falls for August's young wife, Marlena (Reese Witherspoon), and learns that August is an abusive man, both towards animals and humans. Jacob struggles to hide his feelings and to keep his job, despite the circus' money troubles and the tendency of the bosses to redlight workers (throw them off the train in the middle of the night when they no longer need them). Based on the novel by Sara Gruen. "this movie was not the best as they could have chosen actors who like eachother. reece didn't step up to her role because she didn't want to kiss robert as they do not like eachother!" "excellent show.. very intense at times, one that definetly keeps you on the edge of your seat." "Very well acted albeit somewhat desturbing scenes. A very beleivable script"